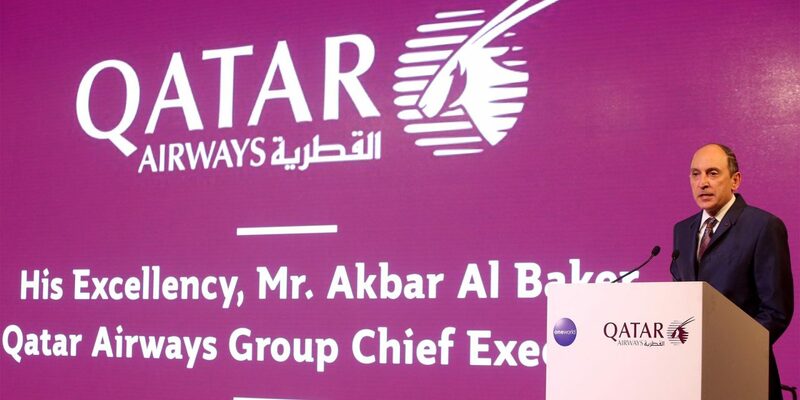 Qatar Airways Group Chief Executive, His Excellency Mr. Akbar Al Baker, landed in Dublin on the 6th July 2017 to host a gala dinner and press conference celebrating the airline’s new direct service between Dublin and Doha. H.E. Mr. Al Baker was welcomed at the airport by Dublin Airport Chief Executive, Mr. Kevin Toland; Dublin Airport Managing Director, Mr. Vincent Harrison and Sheikh Salman bin Jassim Al-Thani from the Qatari embassy in London . The celebrations kicked off with a glamorous gala dinner at the InterContinental Dublin attended by VIPs and celebrities such as presenter and entrepreneur Kathryn Thomas, Irish rugby star Rob Kearney and models Holly Carpenter and Roz Purcell. The stylish crowd enjoyed an energetic performance from the dancers of Riverdance and an electric show from Ronan Keating who had the whole audience up on its feet dancing to some of his most popular hits. On the 6th July 2017, H.E. Mr. Al Baker hosted a crowded press conference at the InterContinental Dublin for Irish and international media from Australia and Qatar who were keen to hear the latest plans for the airline. During the conference H.E. Mr. Al Baker confirmed that Qatar Airways is committed to bringing more visitors to Dublin, boosting tourism to the already popular Irish capital and its neighbouring cities. The new route will also give the people of Ireland the opportunity to connect to more than 150 destinations on the airline’s global network via its hub in Doha, Hamad International Airport. Qatar Airways, one of the fastest growing airlines in the history of aviation, will continue to expand its global network in 2017 and 2018, giving Irish passengers and expats living in Dublin the opportunity to travel seamlessly to more than 150 destinations. An additional 26 new destinations will be launched in 2017 and 2018 including Abidjan, Ivory Coast; Accra, Ghana; Canberra, Australia; Chiang Mai, Thailand; and Mombasa, Kenya. The new direct flights to Dublin will also provide Qatar Airways Cargo’s customers 80 tonnes of belly-hold capacity each week. Temperature-controlled products are the major exports out of Ireland and the cargo carrier is proficient in supporting the air logistics through its specialist solutions QR Pharma, for pharmaceuticals and QR Fresh, for perishables. Customers are offered a seamless cool chain transfer for their temperature-sensitive products via the state-of-the-art and fully automated hub in Doha. Its facility at Hamad International Airport is wholly compliant with both, IATA Chapter 17 standards and Good Distribution Practice (GDP). Qatar Airways has already made an impact in Ireland with its new service flying at almost full capacity in the last few weeks since its launch. The airline has also made its presence in the market felt with key sponsorships at exciting events around the city including the Dublin Horse Show and the Darley Irish Oaks Day at the Curragh Racetrack. Qatar Airways is the national carrier of the State of Qatar, is celebrating 20 years of Going Places Together with travellers across its more than 150 business and leisure destinations. The world’s fast growing airline will add a number of exciting new destinations to its growing network in 2017/18, including Dublin, Nice , Skopje, Sarajevo and many more, flying passengers on board its modern fleet of 199 aircraft.